Leja Jurišić and Teja Reba occupy a bed, interrogate the lives of some rather famous and some less famous male figures, and seem to have loads of fun revealing the hidden and not so hidden connections between female sexuality and patriotism. Ideal is a performance for two performers, a bunch of patriarchal semi-celebrities and a bed. 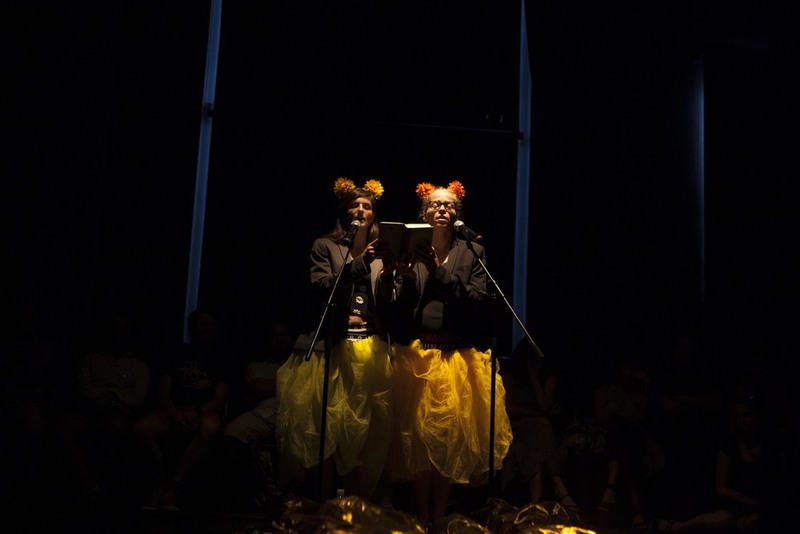 In it, Leja Jurišić and Teja Reba, who operate at the intersection of dance, performance art and (post-dramatic) theatre, grasp Goebels’s division of intimate, personal-public and public life of individual, which they then apply to Marx’s remark that a lot of work gets done in bed. Through a bed, the performers investigate the patriarchal and paternalistic relationships that persist in the world and out of which we have yet to climb, even though we cannot seem to stop pronouncing their dissolution. Jurišić and Reba employ and interrogate the lives of smart, dead and immortal male figures in order to discuss the connections between the female body and female sexuality on the one hand and patriotism and national identity on the other.